The Blackstone Memorial Library in Hyde Park houses one of the jewels of Chicago’s artistic past; a small cupola of beautiful gilt moldings and magnificent murals painted by the celebrated artist, Oliver Dennett Grover. The cupola is currently undergoing a much-anticipated restoration and conservation project sponsored by the Preservation Division of the Chicago Public Library System. The City of Chicago awarded this contract to PARMA Conservation, with a subcontract to Bernacki and Associates, Inc. The collaboration between the two companies has already proved to be a huge success. 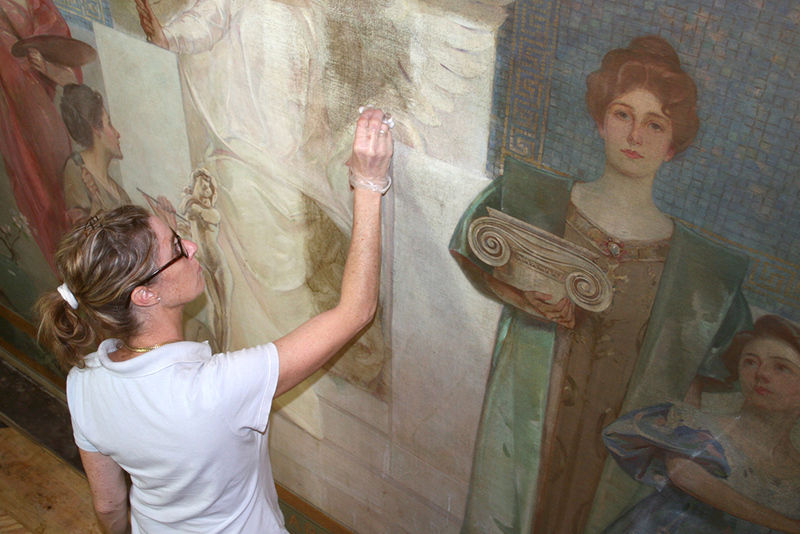 Conservators from both groups are providing their unique expertise to achieve the ultimate goal: restoring the original beauty of the artwork through advanced cleaning techniques. Obvious to the naked eye was the compromised condition of the murals — they appeared dark, dirty, and spatially flat. As the murals date from 1902-1903, this came as no surprise. However, City of Chicago documents suggested that the murals were restored in 1958. This notion seemed at odds with the present-day appearance of the murals. Parma’s tests confirmed the 1958 restoration and provided insight as to why the murals appeared so dirty. 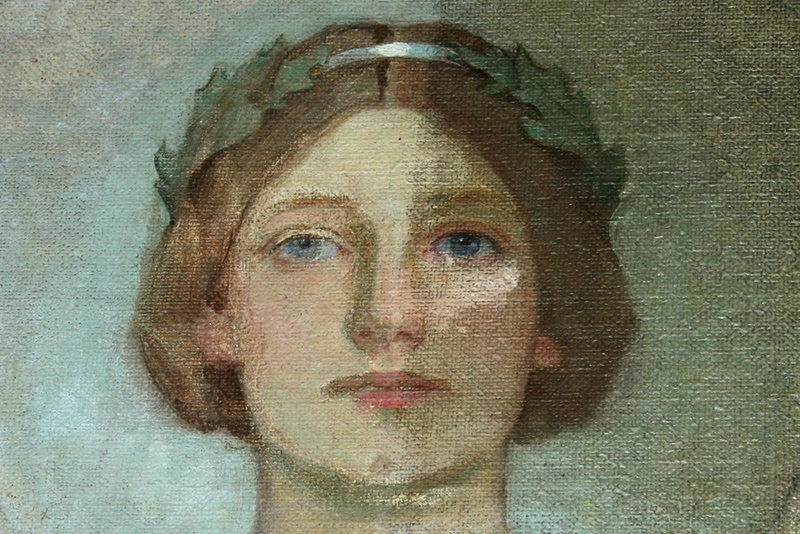 Three distinct non-original layers were found present on the surface of the murals. The first layer was dirt that has accumulated since 1958. The second layer was an alkyd resin varnish coating applied in 1958 (Alkyd resin is a polyester/oil varnish intended for furniture. It darkens tremendously over time). Finally, beneath the alkyd resin was yet more dirt. It seems that when the murals were “restored” in 1958 they were only partially cleaned, and much dirt remained embedded beneath the varnish they had applied. The combination of these layers made the murals look visually worse than if they had never been touched. To remove the three layers, Parma developed a three-phase cleaning system achieving excellent results that reveal the original artwork. 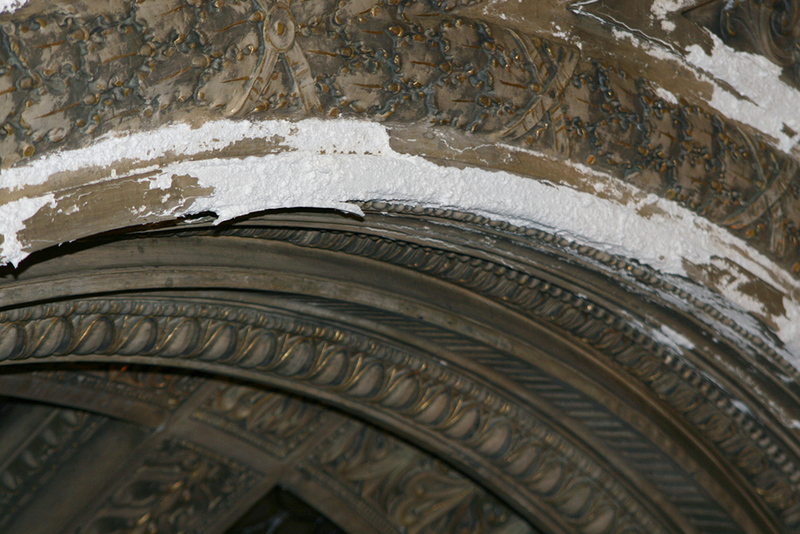 PHOTOS BELOW: The plaster floral ornamentation in the rotunda accentuates the form of the dome as well as frames the wall murals. 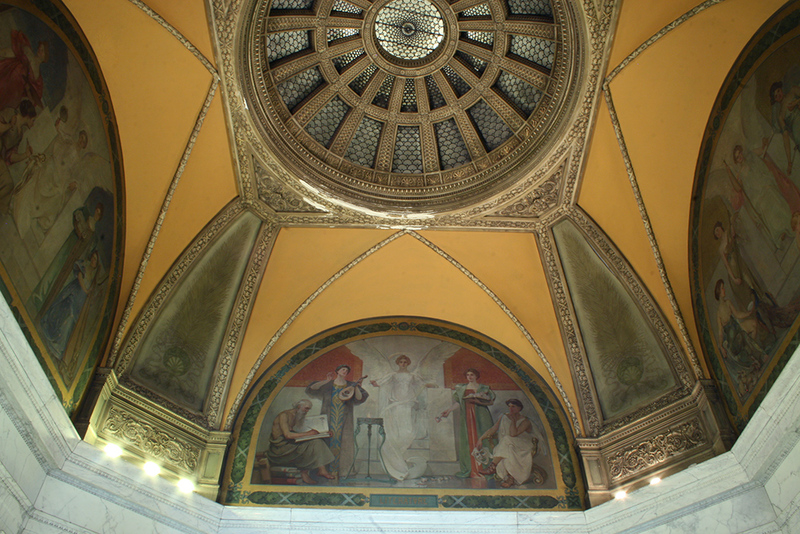 Placed in the cupola vaults, these mural paintings feature the themes of art, literature, science and labor. In these four lunettes emerge a central winged female figure identified as Demeter a Greek goddess who bestowed agriculture and civilization upon the world during the reign of Erechtheus. In a symmetrical balance, each lunette presents four other figures each illustrating a discipline of that defined theme. The photographs were taken after the restoration was completed. The plaster work is extremely dirty with loose dust and debris, and accumulated grime. That is encased in what appears to be an original coating. The plaster work is toned to give a very subtle rubbed patina. There appears to be four different areas of original toning. There are medium dark green rectangles on the spandrel panels. There are two different examples of a greenish/beige toning on most of the flat banding that varies in darkness and thickness. 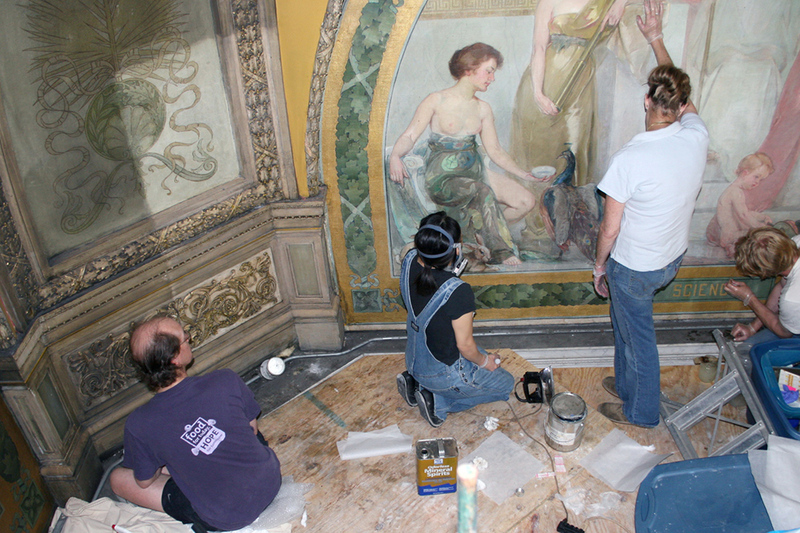 All of the foliage and relief panels have been coated with a gray/beige layer that has been rubbed off all of the highlights. 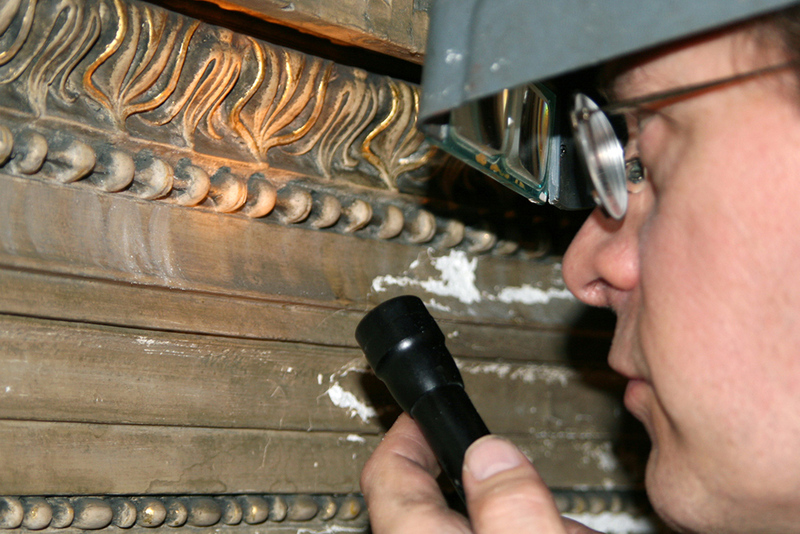 This rubbing appears original due to the overall consistency of the treatment on all areas and the fact that the gilded highlights applied on all of the cast ornament are complete and not rubbed. 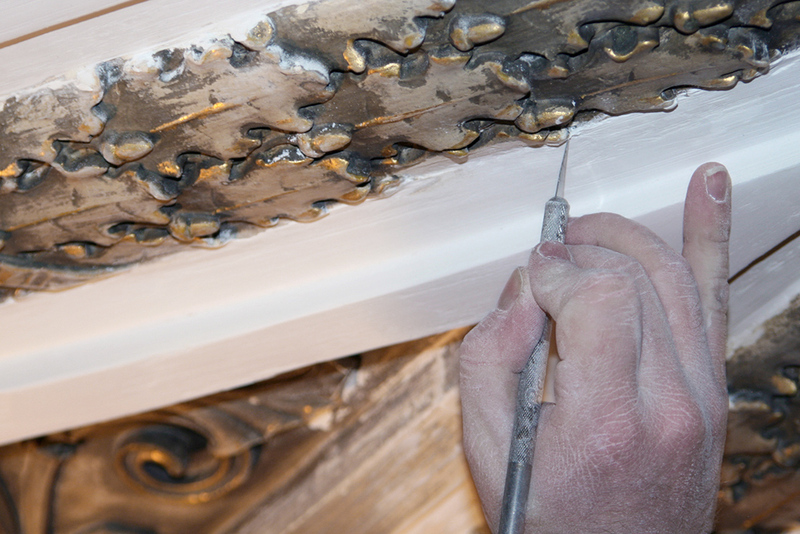 The gilt highlights were oil gilded using a bright yellow toned size applied to the sculptural highlights with a brush. The leaf appears to be gold, not composition leaf, due to the fact of no examples of copper alloy oxidation and no appearance of a protective coating. The gilt has the warmth and brightness of reflection consistent with 23 Kt gold. The Blackstone Library was the first branch of the Chicago Public Library chain, and it was given to the city by Mrs. Isabel Norton Blackstone in memory of her husband, Timothy Beach Blackstone (1822-1900), a noted businessman, developer and philanthropist. 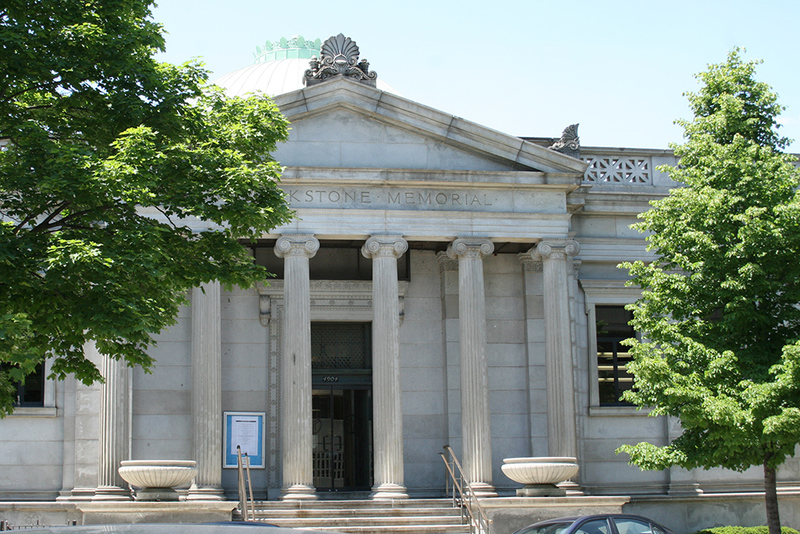 In 1893 there was already another, larger Blackstone Library in Branford, CT dedicated to Blackstone’s father. 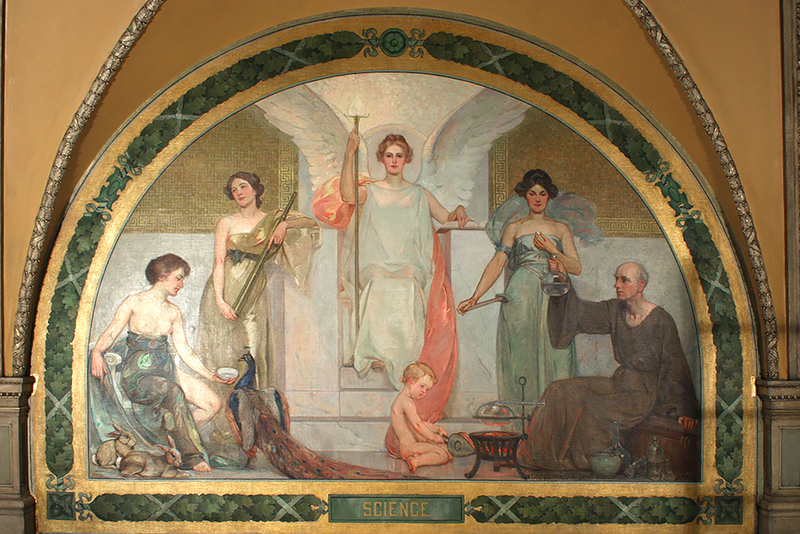 The Branford building was designed by Solon Spencer Beman, and the library murals were created by Oliver Dennett Grover. The architect, Solon Spencer Beman (1853-1914) was a nationally renowned architect who began his training in New York mentored by Richard Upjohn. In 1879, Solon Beman was commissioned by George M. Pullman to design the first planned industrial town in America named the Pullman Community. This project included over 1300 houses, a factory, a water tower, church, theater, hotel, market place and schools in the Chicago area. Other projects included the Studebaker, later the Fine Arts Building, Grand Central Station, the Kimball Mansion and the First Church of Christian Scientist on Drexel Blvd. Beman also designed the Pioneer Building in St. Paul MN, the Pabst Building in Milwaukee, WI and the Michigan Trust Building in Grand Rapids, MI., and the Merchant Tailor’s building at the 1893 World’s Columbian Exposition. Solon S. Beman was, like his teacher, Richard Upjohn, an architect who studied historic architectural styles to better solve the design problems of his time. Unlike his mentor, however, he was interested in and made use of the newest available technologies when he deemed them essential to the solution of the design problem at hand. An architect who worked in a broad range of building types, Beman’s residences and churches are thoroughly demonstrative of historic revival styles, particularly the Gothic and Classical. In his industrial work, however, the style of the building is applied to a practical solution that makes for a tall building with many floors, each having an open floor plan filled with maximum natural light. The Classical Revival Blackstone Library building was modeled after Beman’s Merchant Tailors Building in the 1893 World’s Columbian Exposition and the Erechtheum at the Athenian Acropolis.